ISBN: 978-1-57833-596-1. 330 pages. Copyright 2012. Fishing Alaska Publications. Dimensions: 8.9" x 6". Maps, charts, color photographs. Softbound. The Highway Angler is the most comprehensive and informative guide book yet published on the subject of sport fishing Alaska's roadside waters. Packed with facts, cross-referenced, and easy to read, The Highway Angler tells you everything you need to know -- locations, access, species available, terminal gear, techniques, timing, and much more! It lists in detail more than 750 rivers, creeks, lakes, and saltwater hot spots along the state's major roads and highways from the U.S.-Canada border and the highland drainages of Yukon and Tanana rivers to Kachemak Bay and the popular Kenai Peninsula, and from the frigid coast of the Arctic Ocean to the surf-swept shores of Prince William Sound. For well over a decade, The Highway Angler has successfully guided thousands of people, both novice and expert alike, in discovering some of the best fishing in the world. 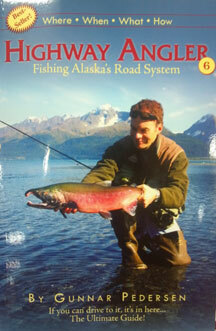 This book is a must for any angler, whether local or visiting, who hopes to wet a line along Alaska's vast road system. These pages provide a thorough look at the opportunities available and the sport fish that inhabit the cold waters of The Last Frontier.